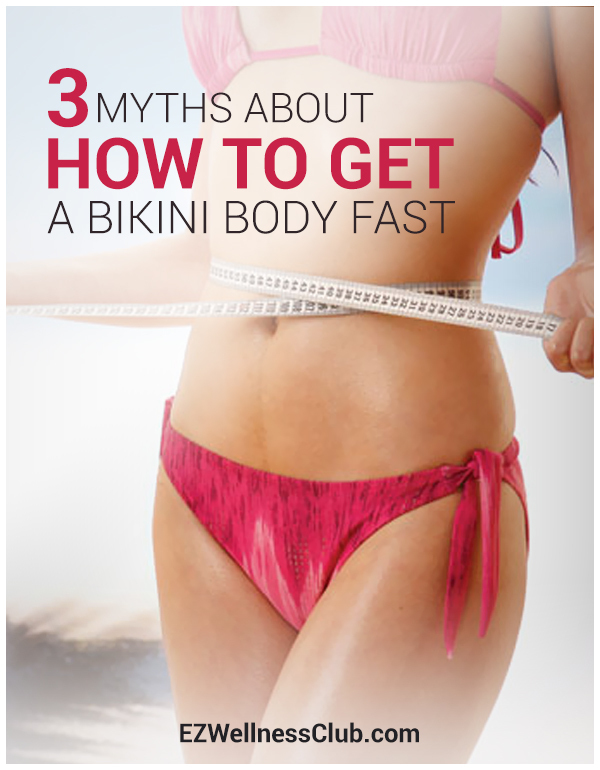 Once beach season rolls around, you’ll probably find yourself seeking tips on how to get a bikini body fast. The thought of putting on that swimsuit and baring more skin is a good motivation for many people to try a new diet or weight loss method. There’s a huge misconception about crunches. Many people think crunches alone will give them flat abs, but they’re unfortunately wrong (see point #2 in this article). Before you can see that six pack, even if you ARE working on those muscles really hard, you have to burn off the fat layer covering your abs first. So instead of focusing on tons of crunches, it’s best to work on getting naturally leaner through moderate exercise and, most importantly, a healthy diet. Trying to reach your target weight by starving yourself is not just ineffective—it’s dangerous too. On paper, it might make sense that severely lowering your amount of calories would help you lose weight fastest, but the body doesn’t work that way. Eating very low calories will mess up your metabolism, only slowing your intended results while you feel miserable and hungry all the time. Being healthy doesn’t have to be that hard! Instead of large calorie restriction, focus on frequent, smaller meals throughout the day. This one is particularly popular right now. Sadly, carbs have been given a bad rap when they don’t deserve it. Eating carbs while losing weight can help you feel satisfied and give you great nutrition and fiber—you just have to focus on the right types. Oatmeal, whole grains, brown rice—all great choices. The key is to avoid carbs made with refined and processed flours, such as white pasta, white bread, and white sugars. Stick to wholesome, intact carbs and you’ll be good to go. Diet plans like the South Beach Diet and Atkins have their own brand of packaged diet foods. Stay away from these! Most of the time, they are full of processed foods and added sugars. They are packaged as “weight loss aids” and “diet foods,” but your body doesn’t need the extra crap. Plus, they can be expensive if you’re eating them as meal replacements. Eat WHOLE, nutritious foods more than anything else. And supplement with high-quality vitamins like those in Mimi’s Miracle Minerals. That is the best weight loss diet. Avoid junk foods. Go through your kitchen and throw out (or give away) anything that is processed, full of fat, or sugary. Then, don’t buy more of the junk. Crowd these foods out with healthy options, and it’ll be part of your normal routine in no time. Focus on eating whole foods. Here’s what to focus on: raw and cooked vegetables, raw fruits, whole grains, lean protein (lean cuts of meat or beans), and small to moderate amounts of nuts and seeds. If you really want to rev up your nutrition, look into adding some superfoods to your diet, such as nori (seaweed), maca powder, camu camu powder. Get exercise each day. If your diet is clean, supplementing that with exercise is the golden combination. Work on a good balance of cardio and strength training (and don’t skip leg day! ), plus some yoga or stretching. And lastly, don’t self-sabotage. Appreciate yourself each day for making healthy choices that support your goals and nourish your body. Beating yourself up will just lead to more unhealthy habits and a toxic mindset, which is not the way to success.